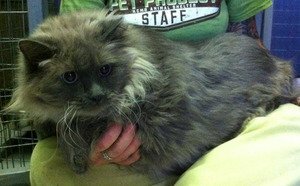 According to CBS5az.com, two cats were left at a Kansas City, Mo., municipal shelter on Wednesday. The two felines, named Blue and Bella, respectively weigh 32 and 22 pounds; both are Siamese mixes. Blue can hardly walk, and has trouble breathing. The story claims it takes two people to carry the cat to his destination. Bella is more mobile, and gets around easily despite her weight. The cats’ owner claimed he could no longer afford to care for the two animals, who are estimated to be between 4 and 6 years of age. Both cats will be put on strict diets but are ineligible for adoption; the shelter will try and keep the cats together. Anyone interested in fostering either of these beauties should check out the KC Pet Project website. After a foster period, the animals may be put up for adoption. Blue and Bella are two more examples of pet obesity. Cats who have a heavy body weight are at risk for a host of ailments, including diabetes and liver disease.